Universal joint and Transmission link, aren't they the same? 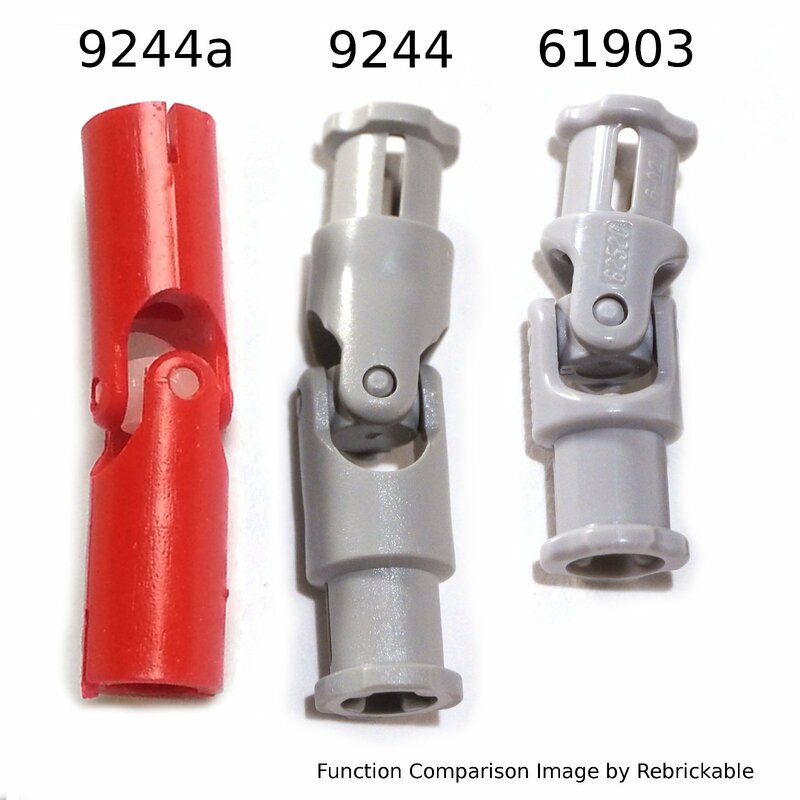 Universal joint 61903 and Transmission link 9244 seems to be different generations of the same item, so perhaps their respective pages here on rebrickable should be merged or interlinked? the biggest difference is one is 4L the other is 3L. They are two very different parts that can’t even really be used as alternates for each other due to the different length. Ok, I see the difference now. I'm surprised the 9244 Technic Universal Joint 4L actually was discontinued by Lego in 2009. These two items can't directly replace each others, but they serves the same function as grey joints and should be interlinked. I seem to have both, so if I have enough light tomorrow, I will create a function comparison image that shows both parts, and add links in the part description of both. They are not the same, but very fact that the length difference is difficult to see, means a good comparison image would be helpful. Part note is definitely the way to go with this because we don’t have an official designation for a similarity like this. I should have a few 61309's, but some are in my Bugatti, which I am NOT taking apart, and I can't find the others. I will order one thru Bricklink and when it arrives, add the comparison photo. Have added some info to 9244, 9244a and 61903. If you need a picture to have them side by side, I can probably take one for you. Just say the word. could you sent it by mail ([email protected]) - I am moving all those comparison images from Bricksafe to the server... don't bother adding text and such, just a photo of all three side by side would be perfect. Thanks in advance! I don't have 9244a unfortunately. Do you still want a picture? Yeah, I think the length difference between the other two is the most important, if needed, I can always stitch two images together. Ok, I plan on taking a few pictures this week. I'll try to do this one at the same time. I found out the hard way. Had a very frustrating hour trying to figure out why the axle on my 8043-1 wouldn't fit. The parts got mixed up with an older set. I had both and didn't notice the difference until I built something that had one of these on each side (my Flapothopter MOC if you're curious) and used two different parts. I realized the difference when it came out all crooked. I received a photo of Vokhev (THX Alex) with 9244 and 61903, and with a bit of magic I combined that with my own photo of 9244a. If all agree I will add this photo to all three parts. Folks, I have had a lot fun with this, and looking at end result, knowing that this is done by several people from different parts of the world, I am really content with it, and I believe that this kind of images are a great help for many thousands of Rebrickable users. I want to do a lot more of these images, and for most, I have the same problem as I had with this one; that is, I have one or two parts I need for the image, but I don't have one or two others. So next week, I will create a new thread in Other Data, entitled "Part Comparison Images", and start posting images there for which I need your help. With this kind cooperation, we can create great images together. Cool! I'll help with those I have. I'm happy to see that improvements have been done.